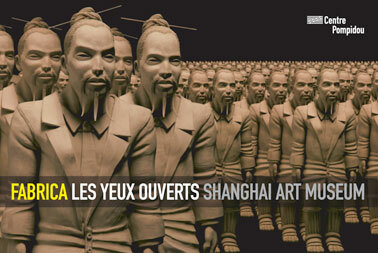 The Centre Pompidou�s Fabrica: les yeux ouverts exhibition goes to China following an invitation by the Shanghai Cultural Development Foundation. The exhibition will be open from 19 October to 11 November at the Shanghai Art Museum as part of the Shanghai eArts Festival. It thus continues on its journey which started in Paris in October 2006 and went on to the Milan Triennale in summer 2007. �Centre Pompidou was honoured to accept the Shanghai Cultural Development Foundation�s invitation. The exhibition has already received many visitors in its previous locations. Visitors have appreciated the interactive universe, which invites them to participate in a sensorial experience allowing them to see through Fabrica�s eyes, which are always focused on the rest of the world.� says Marie-Laure Jousset, Head of Centre Pompidou�s Design Department and curator of the exhibition Fabrica: les yeux ouverts. Housed in the rooms of the Shanghai Art Museum, dating back to the Twenties, the exhibition presents a panorama of the work done over the years by Fabrica, the Benetton Group�s communication research centre. Visitors will see both documentary projects (COLORS magazine and photo reportages) and experimental work (videos, visual communication, interactive installations where visitors can take an active part in the exhibition, thereby giving a personal contribution). Fabrica is a centre for experimentation and innovation set up in 1994 by Luciano Benetton and Oliviero Toscani with the aim of combining �culture� and �industry� in an unprecedented experiment, exploiting the experience of a group which operates in over one hundred nations around the world. Based near Venice in Italy, in a historical architectural complex restored and enlarged by Tadao Ando, Fabrica offers one-year grants to young creative artists from all over the world so they can develop their projects � in fields such as graphics, films, industrial design, publishing, new media or photography � under the guidance of an international team of experts. The Fabrica: les yeux ouverts exhibition�s Far East tour continues in January when the Milan Triennale will host it in the area devoted to Italian design in Tokyo�s Shiodome Creative Center.